The musical fable Pippin is currently on stage at the Weekend Theatre. From the opening blacklit body parts to the “spectacular” finale, there is plenty of “magic to do” on stage. Presumably based on the life of Charlemagne and his son Pepin, it is clearly an early 1970s effort by Stephen Schwartz and Roger O. Hirson working with Bob Fosse to employ new musical techniques to explore boundaries of storytelling. Some work effectively, others not so much. It is a dated show and in the wrong hands (“jazz hands”?) is painfully long and dull. John C. Thompson’s direction of Pippin emphasizes the charms and romance of the story and, while true to the Fossesque-Brechtian techniques, dispenses with aspects which can slow the plot. Thompson adroitly employs the limited stage space by having actors go into the audience from time to time. But he judiciously uses this technique and does it to involve the audience in the story without forcing the much-dreaded “audience participation” which often causes audience members to cringe when actors venture from the stage. Thompson allows each actor to put his or her personal stamp on the character while ensuring that they all stay true to his overall vision – this is easier said than done. Malcolm Glover keeps things moving along on stage as the Leading Player. This part can lend itself to egomaniacal mugging and focus-stealing. Instead Glover steals scenes the honest way – he displays his talented voice and sense of humor to be the ringmaster. He is a pied piper who leads the players and audience on this journey. His deceptively easy manner brings an added bonus as the tone shifts in surprising ways. Julie Atkins is positively radiant as Catherine, a widow. With her clear singing voice and luminous stage presence, she makes the most of her moments in the sun. She easily moves from hope to hostility and from pathos to promise. As her son, Theo, Charlie Askew adds yet another winning portrayal to his resume. This part is often a throwaway plot device. But, with just a few lines, he portrays the petulance and growing maturity of the character. It was nice to see Leroy the dog make another appearance on stage at the Weekend Theatre, this time as Otto the Duck, Theo’s pet. That canine knows how to steal the audience’s heart without stealing focus from the scene. Byron Taylor, Pamela Crane, Evan Tanner and Patti German portray the royal family. Taylor’s King Charles is appropriately weary and hopeful, boastful and insecure. (He also created the show’s clever and clear logo—which tells the show’s story without giving away any secrets.) As his mother Berthe, German has a star turn nearly stealing the show as a randy philosopher. She clearly relishes the fun of the part and her enthusiasm is infectious. Crane is sensual as Queen Fastrada. It is always a pleasure to see Crane dancing, but this time she also got to display her well-honed sense of comic timing. As her son Lewis, Tanner evoked both manly bravado and questionable masculinity at the same time. He played the requisite villain (or at least antagonist) without alienating the audience – which is not an easy feat at all. While all in the “Band of Players” did well, special mention should also be made of three. As a disembodied head, Trevor Arnett proved that one can be a memorable scene partner with just facial expressions and tone of voice. Douglas Hammon and Justin A. Pike were on stage for much of the action holding up a variety of flats – flatography as Mr. Hammon described it. They did not disappear into the scenery but did not distract from it either; from time to time there would be an arched eyebrow or change in posture to add commentary on the story. Pippin ultimately rests on the actor playing Pippin. Craig Wilson has enough talent as an actor, singer and dancer to carry the show. Thankfully, though he was surrounded by adept colleagues and did not have to, it was nice to see his abilities put to good use yet again. He ranged from hopeful to sullen to libidinous as his character matured from youthful academic to slightly wiser and somewhat disillusioned adulthood. This character can be obnoxious and wooden. Wilson avoided the negative pitfalls that are inherent to the character as written. His charm and talent kept the audience rooting for him throughout the journey. From his dance duet with Glover through his tender moments with Atkins and Askew, Wilson also shared the stage well. Jeannie Cross served as musical director; her abilities were evident in making sure that each of the varied styles of songs was well-performed. The orchestra did nicely under Ms. Cross’s direction by ably supporting the performers without overwhelming them in that small space. The choreography was by Mr. Pike with assistance from Jessica Smith, Mr. Wilson, Ms. Crane and Mr. Thompson. It was true to the Fosse style but also matched to the abilities of the performers and the space. Debi Manire’s costumes were fanciful and colorful. They suggested a modern take on medieval and commedia d’ell arte. Sarah Scott Blakey and James Heppler’s lighting properly set the moods and tones of the ever-shifting scenes. Pippin’s meandering plot and serviceable score have kept it mired as a 1970s period piece (along with several other shows). But when approached properly and not treated as a museum piece, it does provide a platform for the magic which is live theatre. The Weekend Theatre deserves much credit for dusting it off and putting it on stage. Attempting rare shows is one of its values and virtues. They deserve huzzahs and plaudits for not settling by merely putting it on stage. 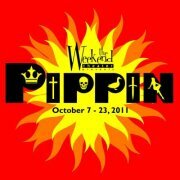 Instead, they created a Pippin which is a thrilling, numinous journey for the audience.